NEW SMYRNA BEACH, Fla. (May 9, 2016) – Local driver Carter Stokes visited victory lane at his home track for the first time in his career on Saturday night. 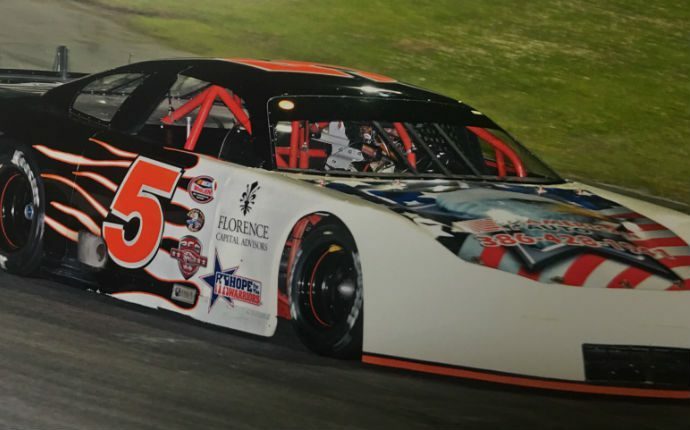 The Richard Childress Racing (RCR) development driver has been racing under the guidance of NASCAR Champion Mike Skinner and his sons Jamie and Dustin Skinner through their company Racecar Solutions while making his transition to asphalt late models. “This was my first win on asphalt, but racing with such a strong team like the one we have at Racecar Solutions, I think there will be many, many more to come,” commented Stokes following the checkered flag. Driving the No. 33 American Auto Chevrolet, Stokes started the race in the seventh position. The 18-year-old picked up one position each lap to take the race lead by lap seven. Two cautions during the closing five laps had Stokes racing side-by-side for the final three laps before ultimately leading the field to the checkered flag. With backing from American Auto, Management Resource Systems, and Mediamix 365, Saturday’s victory marked Stokes’ first win on a paved oval. Stokes’ transition has brought together different generations of the Richard Childress Racing family, as Stokes, a current development driver, has received driver training and coaching from Skinner, who won the 1995 NASCAR Camping World Truck Series championship while driving for RCR. In just nine asphalt races to date, Stokes has brought home one win and six top-five finishes. Stokes had a different teammate on the track this weekend, as team owner Franzone climbed behind the wheel of the No. 5 Racecar Solutions / American Auto / Hope For The Warriors machine and also recorded a top-10 finish in the race.